Mr. Baby was just a young manatee when he was released at Blue Spring State Park in December 2017. He had just spent a year at SeaWorld Orlando’s manatee rehabilitation center with Una, a manatee thought to be his mother who had been rescued for monofilament line entanglement. Mr. Baby’s future was looking bright. Mr. Baby was initially released in December 2017. He wore a tracking device and was monitored to make sure he could survive on his own. Although he was old enough to be weaned at the time of release, it was not known if Mr. Baby would have enough winter experience to survive on his own. He was “tagged,” or fitted with a tracking device, so he could be monitored by the Manatee Rehabilitation Partnership (MRP), a cooperative of agencies, organizations, and oceanaria with a mission to rescue, rehabilitate, and release manatees (Save the Manatee Club is a charter member and MRP partner) . After he was released, Mr. Baby did very well. He left the Blue Spring run and was observed feeding and socializing with other manatees. He also traveled to several areas outside of Blue Spring and was even seen near Lake Monroe, which is about 14 miles away. After a few weeks, he made his way back to Blue Spring’s warm water refuge during a cold spell in early January. These were all signs indicating that he was adjusting to life in the wild. But in April 2018, a manatee was reported in Lake Monroe showing signs of distress. The manatee was rescued and transported to a treatment facility, where he was identified as Mr. Baby. Unfortunately, Mr. Baby passed away in early June. A necropsy found he had consumed various types of man-made debris. 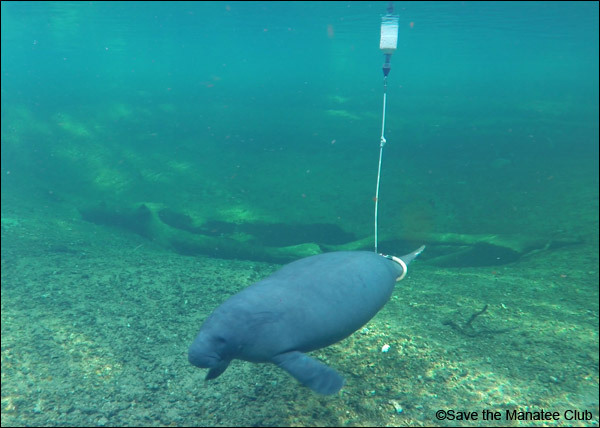 The story of Mr. Baby reminds us that debris in our waterways, such as discarded fishing line and hooks, plastic six-pack holders, and plastic bags, is dangerous to manatees and other wildlife. As herbivores, manatees graze on a large variety of aquatic vegetation. When they are eating, they use their upper lip and flippers to grasp the vegetation. Fishing line, hooks, and other trash that are discarded can become intertwined in vegetation where manatees feed. Fishing line can get tangled around their flippers, or they may accidentally swallow the line or other trash. Hooks can become embedded in a manatee’s lips, mouth, throat, stomach, or intestine, leading to fatal infections. Line entanglement can also lead to infection. When the entanglement injury is severe, the flipper may self-amputate, or a manatee may need to be rescued and transported to a critical care facility where its infected flipper can be surgically removed. Many people may not realize that small things like a fishing hook, plastic bag, or small bit of plastic trash can be big problems for manatees. Watch our video to learn more and what you can do to help. Crab traps can be another source of problems for manatees. Manatees become entangled in the rope that connects the traps to floating buoys at the water’s surface. Entanglement in rope alone may cause serious injury, but entanglements involving ropes still attached to crab traps can be particularly harmful. The weight of the trap causes more severe entanglement wounds. Manatees often drag these traps for miles, and their wounds may become infected and lead to flipper amputation or death if injured manatees are not sighted and rescued promptly. Report sick, injured, or entangled manatees to the Florida Fish and Wildlife Conservation Commission at 1-888-404-3922. Please do not try to cut the entanglement off yourself. For information on reporting manatees outside of Florida, go to savethemanatee.org/rescue. Recycle your trash or throw it away in a proper trash container. Recycle used fishing line. Bins can be found at many marinas, boat ramps, or fishing piers, or at bait and tackle shops. Click the following link to find bin locations in Florida. You can also learn how to make your own recycling bin. Make your own mini-bin out of a tennis ball or other container to keep used line on board your vessel. Participate in a local cleanup event. Check out Save the Manatee Club’s Facebook Events page to see cleanups scheduled in Florida. Join the International Coastal Cleanup on September 15, 2018 in locations all around the world or join the National River Cleanup and find an event near you. Una is one of Save the Manatee Club’s newest adoptees and all proceeds from her adoption are dedicated to the Manatee Rescue and Rehabilitation Partnership. Save the Manatee Club is partnering with Central Florida RECON on cleanup events. See scheduled events at our Facebook Events page. Learn more about Florida’s Monofilament Recovery and Recycling Program and how you can help.